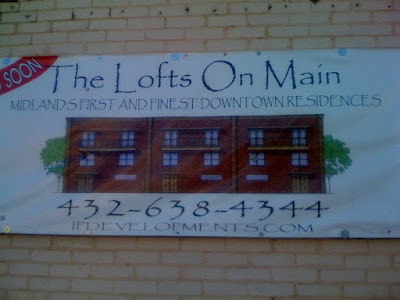 I figured everyone and their dog knew about the lofts being built in downtown Midland. I was wrong. While most people do know about the construction, almost all dogs are ignorant of the facts. So please grab your pooch and share this information with them. The address is 218 N. Main St. (on Street view & Bird's eye view) and the asking price is $355,000 $364,000-$395,500. In the old days it may have been a shoe store, but now it's (or soon to be) the finest in luxury living. And. If that gets pulled, this is the pictures of what it will be. Each will be 3 stories with 2 bedrooms and 3 and a half baths, and measure 2131 square feet plus a garage. But today this is how it looks. These were supposed to open in the summer of 2009. I hear there's only one left, so grab your checkbook, and snap it up before someone else does. And don't worry, pets are welcome, so bring along that ignorant canine. UPDATE: Here's the story NewsWest9 did on the lofts. UPDATED UPDATE: And here's Chris Beckett's walk through.